Passengers involved in the air hijack in Malta yesterday returned to Tripoli early this morning but the motive behind the plane seizure remains a mystery. The passengers left Malta around 4am today on board an Afriqiyah Airways airline and taken to Tripoli, their original destination. A soldier waiting at the steps of the aircraft upon arrival at Mitiga airport was seen waving the new Libyan revolution flag in an apparent act of defiance against one of the hijackers who was seen yesterday in Malta carrying the Gaddafi regime green flag. But a day after the drama, it is still unclear what led the hijackers to seize the plane with the use of fake weapons and divert it to Malta. Some news reports claimed the hijackers requested asylum in Malta, others that they demanded the release of Saif Gaddafi. Efforts to get information about the real motives of the hijackers, who were questioned last night, drew blanks. Home Affairs Minister Carmelo Abela said today the hijackers are expected to be arraigned within the next 48 hours. Armed with replica weapons, the two Libyan nationals forced an internal flight from Sebha to Tripoli to fly to Malta by threatening they would blow up the aircraft with a grenade. A total of 111 passengers and six crew members were on board the aircraft which landed in Malta at 11.32am. 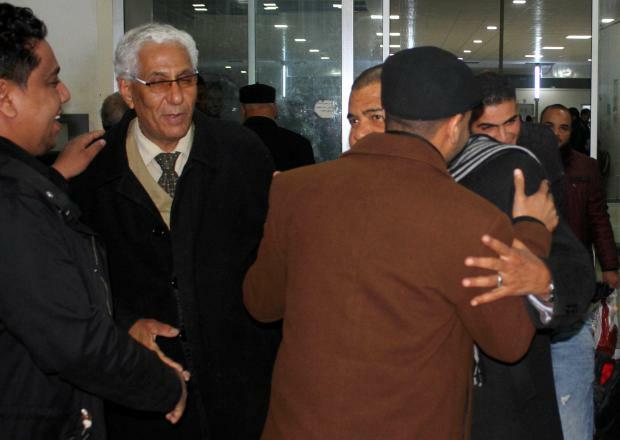 After a four-hour deadlock, the passengers were seen being released in three groups before the hostages surrendered, having declared loyalty to Libya's late leader Muammar Gaddafi. Prime Minister Joseph Muscat said the Maltese authorities made it clear to the hijackers there would be no negotiations unless the passengers were released. But the ease with which the perpetrators gave themselves up without a fight drew comments that the hijackers were totally unprepared for the saga while some commentators went as far as to claim that the hijack was staged. The claims were reinforced by a picture doing the rounds online yesterday purporting to show the pilots taking a selfie during the hijack ordeal. Afriqiyah Airways was quick to point out the picture was taken in the past and not yesterday. Passengers from plane that was hijacked and diverted to Malta return to Tripoli's Mitiga International Airport.